While the hustle and bustle of this week's OKCon is still fresh in my mind, I wanted to write down a few impressions. I was lucky enough to be working on communications of the event; amplifying it online, making sure that people could take part remotely and getting the week's messages heard in places that it matters, which meant I had the opportunity to hear from a lot of you! There were all-women panels – and, wonderfully, they weren't just talking about being women. The session from the Transparency and Accountability Initiative mentors brought 4 brilliant women together to talk on their experiences as TAI mentors, for example. His presentation was effectively a call to action to the younger generation to bring a sense of morality back into the world. As a respected leader, he wants to use his voice to represent those who can actually do something – he genuinely wants to hear from younger people, and stop simply talking amongst old men (his words, not mine!) about how to change the world. It wasn't just about open data. That might be where it started- but we've evolved. The range of speakers and topics really highlighted for me how broad the open knowledge movement is, from Jay talking about malnutrition, to John Ellis on particle physics at CERN, to campaigning and storytelling. The open movement really affects everybody, and it's so much bigger than just open data. The value of face to face meetups. I love the fact that I get to work with a huge virtual community, but being able to sit down with people and talk with them can't be replaced. It's a funny feeling to feel like you already know someone from having had so much virtual contact with them, wanting to hug them like an old friend, but then realising that was the first time you've actually seen them in person. The virtual contact definitely speeds up the 'getting to know you' process, but actually hearing from and seeing people is invaluable. Here's to more face to face meetings, everyone! Passion within the community – it was overwhelming to see how many people give up so much time to grow the open movement. People who are so passionate about open knowledge that they contribute to the community on weekends, evenings, or even lunchtimes while keeping up a day job in an entirely unrelated topic. Those who took holiday from their jobs to spend the week with us- thank you. Diversity within the community – for once, I'm not talking about gender diversity or racial diversity, but the breadth of people OKCon brought together. Talking to other participants there I realised just how varied our professional and personal backgrounds were. As you might have guessed, there were plenty of academics, scientists and tech geeks – but also people who had studied topics ranging from philosophy to forestry, modern languages to gender studies, professional harpists (you know who you are!) to literature. This brought, and continues to bring, an incredible richness to the community which I love. To be honest, I think I probably need at least another week to recover and fully process everything that came up this week. It was inspiring and a true honour to spend the week with you all, and I hope even more people will be joining us next year for OKFestival in Berlin! 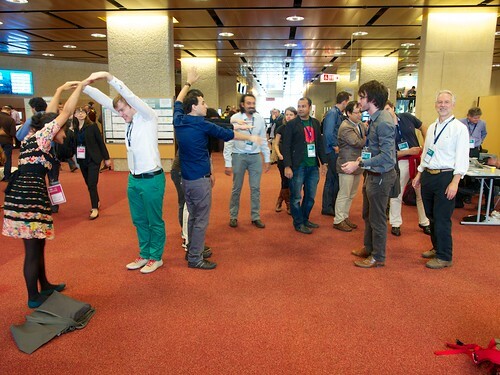 NB - we need to get better at making human OKF shapes... thanks to Ewan Klein for the photos!